A quasar boasts a dusty accretion disk and releases intense radiation in this artist’s illustration. Paul Sutter is an astrophysicist at The Ohio State University and the chief scientist at COSI science center. Sutter is also host of Ask a Spaceman and Space Radio, and leads AstroTours around the world. Sutter contributed this article to Space.com's Expert Voices: Op-Ed & Insights. We all know that supernovas, the titanic explosions caused by the death of a massive star or the catastrophic nuclear ignition of a white dwarf, are some of the most fantastic fireworks nature has to offer. Releasing an enormous amount of energy in a single blast, one supernova can outshine an entire galaxy — that's a few hundred billion stars, for those keeping track — for a few weeks or even months. When they occur close enough to our own sun, they're even visible as a bright pinprick of light during the day, a feat no other star can hope to accomplish. There are giant black holes sitting in the centers of almost every galaxy in the universe. It seems weird to say it, but over the past couple decades it's become a firm observational reality. Our Milky Way galaxy has its very own black heart; we even gave it the name Sagittarius A*, for the region of the sky it sits in. It's no threat to us, sitting tens of thousands of light-years away, but it's truly a whopper, weighing in at more than 4 million times the mass of the sun. This giant (or more technically, supermassive) black hole is currently comparatively placid, only sipping on a thin soup of gas and dust surrounding it. Still, that minimal activity is enough to make it an incredibly loud source of radio emission, first noticed by Karl Jansky in the 1930s. Decades later, radio astronomers noticed many other sources of loud radio emission dotting the sky. Their origin was a mystery until an optical telescope could lock on to one of those targets, revealing what at first appeared to be a star. It was only a single point of light, but its spectrum was off. All the familiar elements were present, but shifted deep into the red, implying an incredibly fast-moving — and distant — object. So, not a star in our Milky Way, but something almost impossibly far-flung, and almost impossibly bright. A radio source that kind of looked like a star. A quasi-stellar radio source. A quasar. Whatever quasars were, they had to be small. Variations in brightness over the course of, say, a week, meant that the source could be no larger than a light-week across (otherwise all the gas couldn't coordinate itself to emit at the same temperature in that amount of time). And it had to be massive, proving enough raw gravitational energy to power the blasts of radiation. 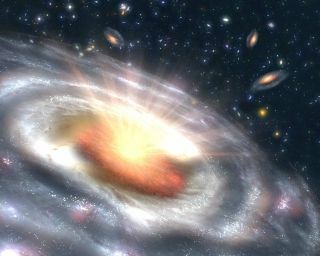 Then theorists made the leap: We have a giant black hole in the Milky Way, with the infalling gas emitting radio waves. These quasars were emitting radio waves. Perhaps they're powered by giant black holes? Indeed, they are. Quasars turned out to be black holes even bigger than Sagittarius A*, reaching into the billions and even tens of billions of solar masses. It's not the black holes themselves emitting all the radiation — they are "black," after all. Instead, as countless tons of material fall into the black hole, it compresses as it all tries to squeeze through the relatively narrow door of the event horizon together. That compression, plus friction, plus the release of all the gravitational potential energy, brings the temperature of the gas up to incredible highs. And it's that hot, compressed has that emits the copious amounts of radiation. A single supernova outshines an entire galaxy for a few weeks. A single quasar can outshine 10,000 galaxies for millions of years. Take that, supernovas, you chumps. Quasars are by far the most powerful engines found in the universe. The energy released is only topped by galaxies themselves merging. But there's more to the quasar story than just gas falling helplessly into a black hole. As the gas falls in, if it has any rotation whatsoever (and it will, by sheer random chance), that spin will amplify due to conservation of angular momentum. As the gas continues to rotate and collapse, it will form an accretion disk. Accretion disks are crazy places, full of twisting and whirling magnetic field lines. Most of the time those lines just sit in the background, following the lead of the swirling gas. But accretion disks also lend themselves to dynamo actions, amplifying magnetic fields well beyond their normal magnitudes. Then it gets crazy. In some cases, the magnetic fields twist and wrap around the black hole, funneling gas away from the event horizon at the last moment and sending it rocketing in two long, thin streams, blasting away from the black hole. These jets can stretch for tens of thousands of light-years, flinging material beyond the confines of the host galaxy itself. These jets will point in any old direction, and by pure random chance some have our solar system in their line of sight. When this happens, we get an especially expressive blast as the gas, traveling at close to the speed of light, hurls radiation ahead of it. An effect called relativistic beaming shapes its emission into a forward-facing cone, giving any hapless observer (e.g., us) an especially breathtaking blast of radiation. These are the blazars, the most powerful member of the quasar family (and the even larger active galactic nucleus clan, but that's another article). Immense beasts of raw power, converting the collapse of material onto a giant black hole into lighthouses that can be seem from the other side of the universe — easily. Learn more by listening to the episode "What Makes a Blazar Blaze So Brightly?" on the Ask A Spaceman podcast, available on iTunes and on the web at http://www.askaspaceman.com. Thanks to @chillidog64, @RuthKearin, Tilak R., @kdawelch, Keith I., and Richard C. for the questions that led to this piece! Ask your own question on Twitter using #AskASpaceman or by following Paul @PaulMattSutter and facebook.com/PaulMattSutter.